For a while the memoir with recipes was a very popular genre. These days there are quite a few memoir cookbooks that offer much more than just a recipe per chapter. They are books you may or may not actually cook from, but you will read them and savor every page because their authors are compelling characters with fascinating journeys and stories to tell. Top of the list for me is Coi. 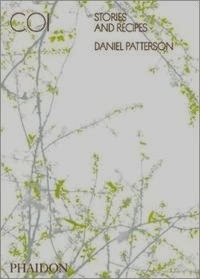 If Daniel Patterson is equal parts culinary genius and awkward social misfit, this book gets to the root of it, in a very soul baring way. He also just happens to be a fantastic writer. The format of the book is completely unique. Long essays on each page are paired with stunning photos and recipes written “longhand” I’d say, with the pesky details like measurements relegated to the index. Sure, it’s tweezer food that you might never cook, but that's beside the point. Each dish comes with so much background and story, it’s a fascinating ride. I really adore this book. 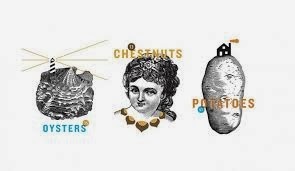 Take a look at this preview of the book from Eater to get a better feel for it. 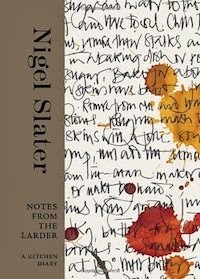 Nigel Slater’s Notes from the Larder is described as a kitchen diary. It’s organized chronologically, almost day by day. Each day gets a journal like entry and a recipe. It’s nearly impossible to use in a conventional manner, unless you resort to the index. But it’s well worth reading nonetheless. Perfect bed time reading really, because you can take in little bits at a time and be inspired and entertained by the wit, wisdom and insight of Slater, along with the heavenly photos and mostly easy peasy recipes for things like Lamb and Mushroom Flatbread, Five Spice Chicken and Pea Shoot Salad, Apricot Couscous, and Blackberry and Hazelnut Cakes (only 7 ingredients!). That should make for sweet dreams. 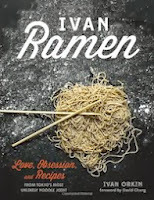 I met Ivan Orkin, the author of Ivan Ramen and was lucky enough to try his food at the CIA Worlds of Flavor conference in Napa a few years ago. His ramen shops are a sensation in Tokyo, and now he is opening a shop in NYC. But if his ramen is a revelation, so is his story with lots of drama and twists and turns. I don’t want to give away even the tiniest bit of his saga. Just read this book! You can also make his recipes, but honestly, even if you don’t, you won’t be able to put this book down. Enough said. Another fascinating character I met at a CIA Worlds of Flavor conference was Roy Choi of Kogi BBQ and Korean taco fame. A classically trained chef, it was when he reconnected with his roots that he went from struggling corporate chef to finding his true calling. 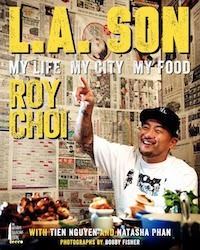 His story told in L.A Son: My Life, My City, My Food is about growing up as an immigrant in LA, flirting with drugs and gambling and the roller coaster ride of food trucks and restaurants. The recipes fall into the categories of Mexican, Korean and guilty pleasure. Carne Asada, Korean Carpaccio, Ghetto Pillsbury Fried Donuts, Korean-Style Braised Short-Rib Stew, Perfect Instant Ramen, Coconut Clam Chowder. Really the whole book is a guilty pleasure. While Orkin and Choi are very much on trend and of the moment, Anne Willan is old school. The founder of the famed La Varenne cooking school in France, she is an accomplished cooking teacher, food writer and cookbook author. 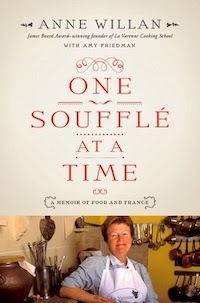 Her latest book, One Souffle at a Time, is a memoir with recipes, fifty of them in all. It’s a book for Francophiles and those who enjoy anecdotes about Julia Child, James Beard, Craig Claiborne, and other American, French and British food writers and luminaries primarily from the 70’s and 80’s. It turns out Willan is not just a great cooking teacher, but a great story teller as well. Last but not least is a “not cookbook” 50 Foods, The Essentials of Good Taste by Edward Behr, one of the best food writers around. But don't take my word for it, read an excerpt. Equally authoritative and opinionated, you can’t help but learn something when reading what Behr has to say. In this encyclopedic style reference book he shares his picks for favored ingredients along with how to buy, what complements the ingredient and “notes on wine.” His picks? Things like Asparagus, Cabbage, Chestnuts, Goose, Honey, Lemons, Pears, Potatoes, Strawberries and Sweetbreads. No recipes, but lots of useful information that will make you a better cook. The illustrations are really appealing in this book. I am giving away one copy of 50 Foods, The Essentials of Good Taste by Edward Behr, courtesy of the publisher, Penguin Press. Leave me a comment telling me your favorite nightstand cookbook or culinary memoir. One entry per person and mailing address must be in the US. Winner will be chosen at random on January 10, 2014 noon PST. Disclaimer: Some of these books were provided as review copies. This post contains affiliate links.